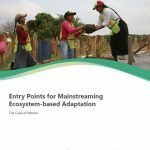 This study highlights success factors and entry points for mainstreaming EbA based on 16 practical case studies from Mexico, Peru, South Africa, Philippines and Viet Nam in the following contexts: 1. 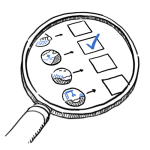 National planning and development processes (e.g. climate policy and budget allocation) 2. Sectoral policies and regulatory frameworks (e.g. sector planning and land-use planning) 3. 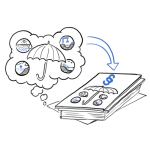 Local and community planning processes (e.g. village planning, municipal planning) 4. Private sector engagement (e.g. public-private partnerships) 5. Capacity building. It also summarizes emerging lessons learnt for mainstreaming, including identifying policy entry points, strengthen institutional collaboration, engaging multiple actors and effective communication. 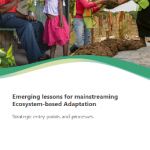 This report reflects the knowledge, experience and lessons learned of the many practitioners who have been leaders in the design, implementation and mainstreaming of ecosystem-based adaptation (EbA) measures. 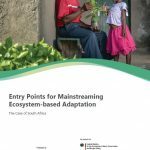 It is based on the findings of four country reports on ‘entry points for EbA mainstreaming’, expert dialogues within the BMU IKI funded International EbA Community of Practice (EbA-CoP), and case studies from the web-platform PANORAMA Solutions for a Healthy Planet. 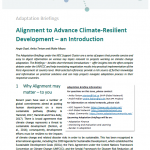 This paper is the second of the Adaptation Briefing series under the NDC Support Cluster, which aims to provide concise and easy to digest information on key topics, relevant for projects working on climate change adaptation. 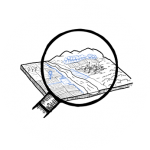 The Briefings – besides short thematic introductions – offer well-selected references, which provide a rich source of further knowledge and information on practical solutions and can help projects navigate adaptation processes in their respective countries. 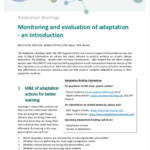 This briefing offers short insights into the benefits of monitoring, evaluation and learning of adaptation measures and how integrated monitoring systems can help to keep sustainable development on track. It shortly outlines the debate on M&E under the Paris Agreement and Katowice and provides a rich list of further sources of information. Every year, emerging economies and developing countries invest billions in long‐term infrastructure projects. However, their plans often fail to take account of future climate change. This leads to high risks of damage and misguided investments. This especially accounts for the Nile Basin, where water related infrastructure provides food and energy security to entire nations. Known as Climate Services, user‐oriented climate information and products (e.g. 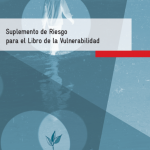 risk and vulnerability analyses) are required that enable public and private decision‐makers to raise the resilience of national infrastructures. 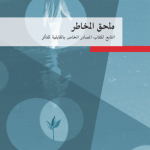 Many countries within the Nile Basin region so far lack the institutional, technical and service‐related conditions they need to set up and mainstream climate services in their planning procedures and regulations. In order to enhance the provision of Climate Services for infrastructure investments, a baseline assessment of available Climate Services has been conducted focusing on the assessment of respective capabilities of National Meteorological and Hydrological Services (NMHS) in Burundi, DR Congo, Ethiopia, Kenya, South Sudan, Sudan and Uganda. The assessment is based on data collected in interviews, surveys and workshops. The incorporation of climate change into infrastructure planning is one of the greatest challenges of the 21st century. Due to insufficient planning and usage of climate services and predictions, adaptation measures failed under the threat of climatic events. Such an example can be seen in the floods in Dresden, Hamburg and other cities in many conceding years, where the waters still managed to flood the city, although adaptation measures had been put in place. 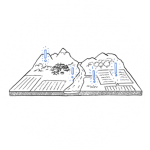 Therefore the question arises of, how does the planning of certain infrastructure projects work and where are the entry points for climate data and information? The act of planning, organizing and constructing any infrastructure project however is a very complex and comprehensive topic. The process runs through a lot of steps and incorporates a vast sum of actors involved. This report aims to give an overview of the planning processes in Germany for bridges, hydropower dams and coastal protection and where in such processes climate data are required. 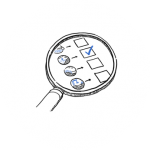 Certain codes, standards, norms and regulations will be assessed to understand how the decision making processes are influenced. The Assessment of Climate Service Providers Capabilities in Brazil has been conducted as part of the baseline asssessment for the Climate Service for Infrastructure Investment (CSI) project. It demonstrates that a diverse set of stakeholders exist that provides Climate Services for different sectors and decision making context. Nontheless it also demonstrates a shortcoming that many stakeholders in the Climate Service debate address: The lack of adequate exchange with users of Climate Services for the delivery of tailor made and user-centred climate Information products. The report is in Portuguese. 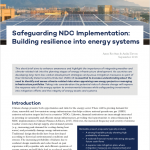 This is the second in a series of briefs by the NAP Global Network focusing on alignment of country efforts under the 2030 Agenda for Sustainable Development, the Paris Agreement and the Sendai Framework for Disaster Risk Reduction. The brief explores how countries can get started on aligning different policy processes by defining alignment objectives, identifying entry points and putting enabling factors in place. Most adaptation actions are local and closely related to development needs, so it is important to develop and use local monitoring and evaluation (M&E) systems to capture what is happening on the ground and integrate lessons from this into national and global M&E systems. 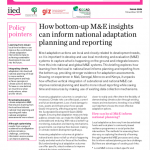 This briefing by the International Institute for Environment and Development (iied) explores how learning from the local to national level informs planning and reporting from the bottom up, providing stronger evidence for adaptation assessments. Drawing on experience in Mali, Senegal, Morocco and Kenya, it unpacks how effective vertical integration of subnational and national M&E can improve national planning and lead to more robust reporting while saving time and resources by making use of existing data collection mechanisms. 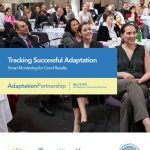 On November 23, 2018, the second version of the ‘Methodology for the Prioritization of Adaptation Measures against Climate Change’ (in Spanish) was launched at the Soumaya Museum in Mexico City. 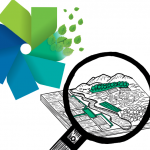 The Methodology integrates and deepens the use of EbA and is designed to work with those adaptation measures that make use of environmental services (or ecosystem services), biodiversity and other activities that can be classified as “green” to reduce a population’s vulnerability, both rural and urban. With the help of these tools and through capacity building, Mexico will be able to select, prioritize and implement a portfolio of adaptation measures that increase the adaptive capacities ad reduce vulnerabilities of the systems and actors involved. 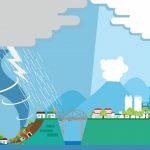 Comprehensive Climate Risk Management (CRM) is an approach that aims to manage risk along the entire risk continuum, from short-term extreme weather events such as storms and floods to long-term gradual changes such as sea level rise and desertification. 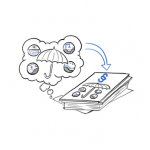 Instead of applying individual and standalone measures, it involves a combination of proven and innovative instruments that enlarges our understanding of adaptation as integrated, participatory and iterative approach to manage climate-related risk. This info sheet introduces GIZs risk-based approach to manage Loss & Damage. By analysing risks and identifying suitable solutions on a technical level, this approach supports decision makers from the public and private sector in forward-looking planning. 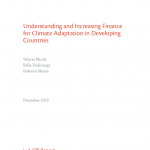 The study by the Climate Policy Initiative (CPI) and adelphi explores the current state of finance for climate adaptation and proposes practical, near term solutions to both fill in knowledge gaps and to increase investment. 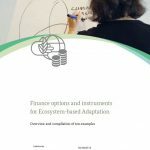 While many of the suggestions can also be applied in developed countries, which often face similar challenges in measuring and deploying adaptation finance, the focus of the report and selected examples highlight the role for developing country national governments and stakeholders in supporting increased knowledge and investment in adaptation. Latter comprise development finance institutions, local governments, and civil society organizations including academic institutions. 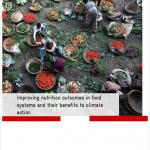 This new publication by GIZ explores the overlap between climate-smart food production and nutrition sensitive food consumption. 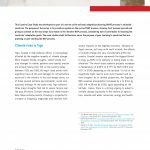 The policy brief gives an overview of the global climate challenge, the global nutrition crisis and links the two by proposing so called “demand side measures”. This group of actions includes food loss and waste reduction and changes in human diets towards products that are less GHG intensive. Concrete examples are presented on how industrialized and developed countries alike have started tackling this challenge by strengthening urban-rural linkages in food systems, linking nutrition outcomes to climate change outcomes, and mainstreaming nutrition outcomes across sectors beyond agriculture. Latin American countries are highly vulnerable to the effects of climate change, in particular to the intensity of rainy periods, which increase the probability of floods and landslides, as well as to periods of prolonged droughts. 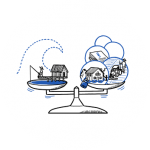 Restoring environmental water functions through sustainable mechanisms is an option to link ecosystems, cities and climate risk. Through the GIZ Sector Network for Environmental Management and Rural Development (GADeR-ALC) Colombia, Bolivia, Peru and Ecuador came together to develop technical-communication material that shows in a practical way how Water Funds are an option to implement Ecosystem-based Adaptation measures. Water Funds are stable, transparent and long-term financial mechanisms that gather a variety of users as well as public and private actors around a common goal to contribute to water security through Nature-based Solutions and sustainable watershed management. 4th EbA Knowledge Day – organized by the Secretariat of CBD, GIZ and IUCN at the Rio Conventions Pavilion of CBD COP 14 – convened under the overall theme of ‘Biodiversity conservation and infrastructure development.’ The event included input presentations, panel discussions and a market place showcasing practical examples of nature-based solutions and possibilities how to better align these to engineering-based solutions for disaster and climate resilience. Participants learnt from current approaches, opportunities and challenges for aligning biodiversity conservation with infrastructure development in the context of climate change adaptation and disaster risk reduction both at policy and implementation level. 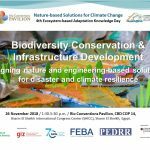 The event was organized in collaboration with the Friends of Ecosystem-based Adaptation (FEBA) and Partnership for Environment and Disaster Risk Reduction (PEDRR) networks. Los países de Latinoamérica son altamente vulnerables ante los efectos del cambio climático, en especial por la intensidad de los períodos de lluvia los cuales aumentan la probabilidad de inundaciones y deslaves, así como por los períodos de sequías prolongados. El restaurar funciones ambientales hídricas mediante mecanismos sostenibles es una opción para vincular ecosistemas, ciudades y riesgo climático. Colombia, Bolivia, Perú y Ecuador a través de la Red Sectorial de Gestión Ambiental y Desarrollo Rural – GADeR-ALC de GIZ se unieron para desarrollar material técnico – comunicacional que muestre de manera práctica cómo los Fondos de Agua son una alternativa para implementar acciones de Adaptación basada en Ecosistemas. Un Fondo de Agua es un mecanismo técnico – financiero estable y de largo plazo que une a distintos usuarios y actores en la búsqueda de soluciones a una problemática común en torno al agua y a la cuenca. El documento sobre ”Finanzas innovadoras para la Adaptación basada en Ecosistemas (AbE) – Involucramiento del sector privado” presenta los resultados del Grupo de Trabajo sobre financiamiento innovador para AbE de la red GADeR – ALC de GIZ. 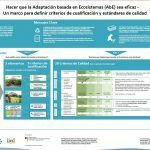 El documento explica paso a paso la metodología desarrollada por el Programa EbA “Estrategias de Adaptación basada en Ecosistemas en Colombia y Ecuador” para el diseño participativo de mecanismos financieros innovadores que aprovechen las oportunidades financieras locales, de manera que se fenere confianza entre los actores y transparencia a las inversiones. El documento también presenta los resultados del desarrollo de un instrumento financiero con involucramiento del sector privado para Cartagena de Indias en Colombia, enfocado en la compensación de huella de carbono de eventos locales que aportan a incrementar y mantener el arbolado público de la ciudad. Por último, se exponen algunas conclusiones del proceso y referencias para el desarrollo de la metodología. 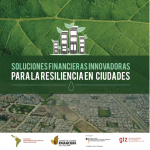 La Cartilla presenta las memorias del Encuentro: Soluciones Financieras Innovadoras para la Resiliencia en Ciudades llevado a cabo en la ciudad de Bogotá los días 4 y 5 de agosto del año 2016, que tenía como objetivo identificar soluciones financieras innovadoras para la resiliencia en ciudades. El Encuentro ofreció un espacio de intercambio y transferencia de conocimientos a partir de presentaciones de expertos y paneles de discusión, en donde se expusieron diferentes visiones y enfoques acerca de la adaptación al cambio climático, así como programas existentes y mecanismos financieros para proyectos de adaptación al cambio climático que ya están en implementación. Esta publicación busca poner a disposición de las autoridades locales, regionales y nacionales, información sobre el desarrollo e implementación actual de instrumentos financieros innovadores, así como una metodología participativa que permite diseñar de manera colectiva instrumentos financieros a partir de sus componentes jurídico, comercial, financiero, institucional y técnico, así como identificar los retos y oportunidades para su implementación. 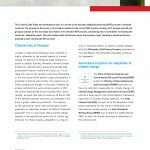 La Cartilla presenta el trabajo conjunto que viene adelantando el Comité de gestión Financiera del Sistema Nacional de Cambio Climático de Colombia, la Deutsche Gesellschaft für Internationale Zusammenarbeit GIZ – GmbH, el Programa de Naciones Unidas para el desarrollo – PNUD y el Programa de Preparación al Fondo Verde del Clima, en el marco del Plan Nacional de Adaptación al Cambio Climático de Colombia. La cartilla “Soluciones financieras innovadoras para la resiliencia en ciudades” es el resultado del trabajo del Work Stream de la Red GADeR-ALC sobre innovación en el financiamiento de medidas de adaptación basada en ecosistemas – AbE. Climate change impacts are already being felt around the world and they seriously threaten the achievement of the Sustainable Development Goals. With climate impacts playing out in endlessly varying combinations, policymakers need effective systems for learning what sort of adaptation works. 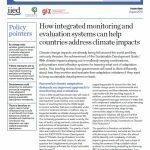 This briefing by the International Institute for Environment and Development (iied) shows how governments will need to think differently about how they monitor and evaluate their adaptation initiatives if they want to keep sustainable development on track. There is broad agreement that climate change represents a threat to sustainable development; consequently, development efforts must be resilient to the impacts of climate change and related disaster risks in order to be sustainable. 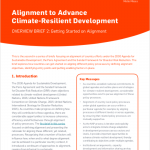 This is the first in a series of briefs by the NAP Global Network focusing on alignment of country efforts under the 2030 Agenda for Sustainable Development, the Paris Agreement and the Sendai Framework for Disaster Risk Reduction. This initial brief provides an introduction to the concept of alignment as it relates to these policy processes. 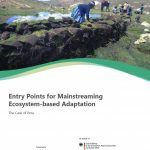 ‘From the mountain pastures of Peru, to the coral reefs of Vanuatu…’ Ecosystem-based Adaptation is a topic of global relevance that is implemented successfully in a broad range of countries and ecosystems. 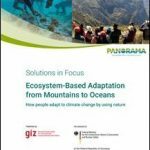 A new publication developed by GIZ under the PANORAMA initiative illustrates the diversity of EbA in practice – ‘from mountains to oceans’ – that can be found online at the PANORAMA — Solutions for a Healthy Planet platform (www.panorama.solutions). A selection of 30 applied EbA measures (solutions) is presented along the following chapters: 1. Mountain, grassland and forest ecosystems 2. River, wetland and inland water ecosystems 3. Agro-ecosystems and drylands 4. Urban ecosystems 5. 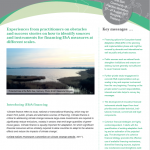 Marine and coastal ecosystems This publication intends to inspire policy and decision makers as well as project developers, showing that EbA has ‘many faces’ and is being implemented successfully by a broad range of actors and organizations. 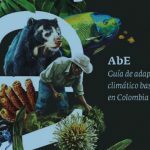 El Ministerio de Medio Ambiente y Desarrollo Sostenible de Colombia con apoyo de TNC, GIZ, BMU, WWF y USAID desarrollaron la Guía de AbE en Colombia, la cual busca posicionar la importancia de los ecosistemas y los servicios que estos prestan para aumentar la resiliencia y disminuir la vulnerabilidad a la variabilidad y el cambio climático. 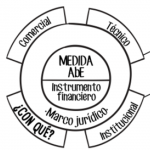 El documento explica de manera sencilla la forma en que los tomadores de decisiones pueden incorporar el enfoque AbE principalmente en la formulación de proyectos, así como también en su gestión o planificación. Drawing on experience in 11 countries and the European Union, this paper provides core elements and concrete examples for jointly advancing these agendas, with a focus on five challenges: coordinating institutions, aligning national climate and SDG-relevant targets, mainstreaming both set of goals into policy planning, optimizing financial resources, and building mutually reinforcing monitoring and reporting frameworks. The research also explores how international development can better support national efforts at linking both agendas. This study shows that joining up implementation requires governments to make significant shifts in institutional, policy, financial, and monitoring frameworks in order to enhance policy coherence, and cost efficiency. La comunidad internacional de práctica sobre la AbE tiene por objetivo el intercambio del conocimiento y de la experiencia y el aprendizaje mutuo sobre la adaptación basada en ecosistemas (AbE) más allá de proyectos, instituciones y fronteras regionales. El propósito es desarrollar el enfoque AbE, dar a conocer lecciones aprendidas y buenas prácticas para diseñar e implementar la AbE con el fin de ayudar a la gente a adaptarse a los efectos adversos del cambio climático. 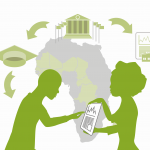 This case study from South Africa was developed by GIZ as part of a series which summarizes promising policy entry points and governance structures for EbA mainstreaming at policy and practitioner level. It provides five examples that illustrate the diversity of initiatives that support the mainstreaming of EbA but also show existing barriers. 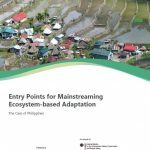 This case study from the Philippines was developed by GIZ as part of a series which summarizes promising policy entry points and governance structures for EbA mainstreaming at policy and practitioner level. The study also provides further opportunities and recommendations how to strengthen EbA in policy and practice in the long run. 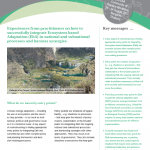 This case study from Peru was developed by GIZ as part of a series which summarizes promising policy entry points and governance structures for EbA mainstreaming at policy and practitioner level. It provides four examples that illustrate the diversity of initiatives that support the mainstreaming of EbA but also show existing barriers. 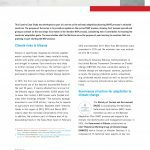 This case study from Mexico was developed by GIZ as part of a series which summarizes promising policy entry points and governance structures for EbA mainstreaming at policy and practitioner level. It provides three examples that illustrate the diversity of initiatives that support the mainstreaming of EbA but also show existing barriers. How does climate change affect human mobility? The IPCC confirms that human mobility does not have a single cause but rather emerges from multiple factors. These include poverty and demographic pressure, bad governance, depletion of natural resources or armed conflicts and violence. Economic reasons, especially regional income disparities between rural and urban areas, remain the most significant drivers of move-ment. However, climate change is an additional driver. 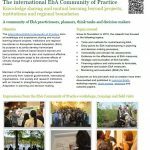 The international EbA Community of Practice aims at knowledge and experience sharing and mutual learning beyond projects, institutions and regional boundaries on Ecosystem-based Adaptation (EbA). Its purpose is to jointly develop harmonized approaches, evidence-based lessons learned and best practices for how to plan and implement effective EbA to help people adapt to the adverse effects of climate change through a collaborative learning process. 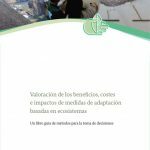 Instrumentos para aumentar la toma de decisiones en la adaptación al cambio climático – Un libro guía para los planificadores de adaptación, gerentes e inversores Resumen: Este libro guía ofrece asistencia a los planificadores de adaptación en aumentar la conciencia, el conocimiento y la capacidad para valorar los costes, beneficios e impactos de medidas de adaptación basadas en ecosistemas (AbE) en comparación (y combinación) con las medidas grises. Combina la información sobre la teoría de valoración y métodos con 40 ejemplos del mundo real, así como los pasos prácticos para encargar, diseñar e implementar los estudios de valoración de AbE. 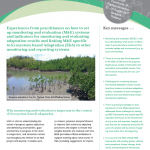 Experiences from practitioners on how to set up monitoring and evaluation (M&E) systems and indicators for monitoring and evaluating adaptation results and linking M&E specific to Ecosystem-based Adaptation (EbA) to other monitoring and reporting systems. 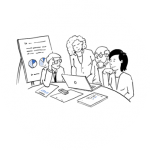 This learning brief is a result of a learning and dialogue workshop, including three technical sessions, held within the 2nd international EbA Community of Practice Workshop that was conducted between 21 and 24 August 2017 in Bangkok, Thailand. Experiences from practitioners on obstacles and success stories on how to identify sources and instruments for financing EbA measures at different scales. This learning brief is a result of a learning and dialogue workshop, including three technical sessions, held within the 2nd international EbA Community of Practice Workshop that was conducted between 21 and 24 August 2017 in Bangkok, Thailand. 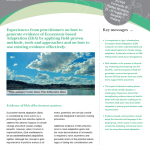 Experiences from practitioners on how to generate evidence of Ecosystem-based Adaptation (EbA) by applying field-proven methods, tools and approaches and on how to use existing evidence effectively. This learning brief is a result of a learning and dialogue workshop, including three technical sessions, held within the 2nd international EbA Community of Practice Workshop that was conducted between 21 and 24 August 2017 in Bangkok, Thailand. Tools for enhancing climate adaptation decision-making – A sourcebook for adaptation planners, managers and investors Summary: This sourcebook helps to assist adaptation planners in building awareness, knowledge and capacity for valuing the costs, benefits and impacts of Ecosystem-based Adaptation (EbA) measures in comparison (and combination) with grey measures. It combines information on valuation theory and methods with 40 real-world examples, as well as, practical steps for commissioning, designing and implementing EbA valuation studies. 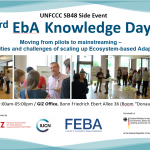 Workshop report of the 2nd Ecosystem-based Adaptation (EbA) Knowledge Day – hosted by GIZ, IUCN, IIED and DIE under the Friends of EbA (FEBA) network – during COP 23 in Bonn focussing on the topic ‘Strengthening Ecosystem-based Adaptation in policy frameworks: Communicating benefits, developing financing strategies’. Tracking Successful Adaptation. Smart monitoring for good results. Adaptation Partnership Workshop Report 2012. Report of the 2012 Workshop on M&E of Adaptation organised by the Adaptation Partnership, GIZ and USAID. 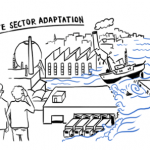 Engaging the Private Sector in Adaptation to Climate Change in Developing Countries: Importance, Status, and Challenges. Biagini, B. and Miller, A. (2013). Engaging the Private Sector in Adaptation to Climate Change in Developing Countries: Importance, Status, and Challenges. Summary: This paper summarizes why it is necessary but difficult for the private sector to adapt to climate change. It describes measures for promoting private investments in climate resilience and highlights the need for much more focused and detailed analysis of business opportunities arising from climate change. Adapting to Climate Change: Methods and Tools for Climate Risk Management. CSC (2014). Adapting to Climate Change: Methods and Tools for Climate Risk Management. 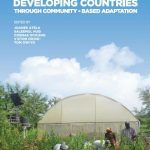 Summary: This guidebook seeks to provide organitzizations with the information they need in order to understand the range of issues involved in adaptation, and to help them make informed decisions about how they may make progress with adaptation planning in practice. 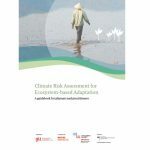 It explains why adaptation is climate risk management and provides a comprehensive overview of methods and tools for climate risk assessment. World Resources Institute, UNDP (2015): Adapting From The Ground Up – Enabling Small Businesses in Developing Countries to Adapt to Climate Change. Summary: The report highlights how the public sector, with assistance from development partners, NGOs, and others, can create an enabling environment which will encourage micro and small enterprises (MSEs) in developing countries to invest in adaptation. The analysis is based on numerous case studies. The Business Case for Responsible Corporate Adaptation: Strengthening Private Sector and Community Resilience. UN Global Compact, UN Environment Programme, Oxfam, World Resources Institute (2015). The Business Case for Responsible Corporate Adaptation: Strengthening Private Sector and Community Resilience. Summary: This report highlights how companies can adapt to climate change, and how to address the most pressing challenges that hamper private sector progress. It shares lessons learned from 17 case studies and provides actionable guidance for public and private sector leaders to accelerate responsible corporate adaptation. Trabacchi, C.; Stadelmann, M. (2013). 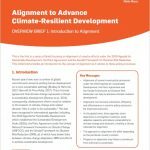 Making Adaptation a Private Sector Business: Insights from the Pilot Program for Climate Resilience in Nepal. Climate Policy Initiative. San Giorgio Group Case Study. 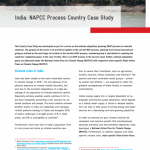 Summary: This case study assesses a private sector project run by the IFC in Nepal. The project engages and develops the capacity of agribusiness firms and local commercial banks to transfer skills and resources to farmers, thus promoting climate resilience in the agricultural sector. The report also explores opportunities for scaling-up and replicating private sector engagement. This policy brief examines the feasibility and practicability of a set of common global adaptation indicators and their use in context of the Paris Agreement. It looks at the different purposes of applying adaptation metrics and provides recommendations for their targeted use. 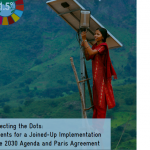 Opportunities and limits of connecting the monitoring of the implementation of the Paris Agreement, the Sustainable Development Goals (SDGs) and the Sendai Framework for Disaster Risk Reduction are explored. The policy brief provides recommendations for complementary national and lobal monitoring and reporting towards their objectives in regard to adaptation to climate change. El presente informe de políticas estudia los beneficios, oportunidades y desafíos que supone recurrir al proceso PNAD para implementar los objetivos de adaptación de las NDC y de qué forma el proceso PNAD puede servir como base para iteraciones futuras. 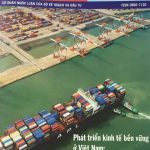 Este documento de orientación política expone que la vinculación entre el proceso PNAD y las NDCs puede promover una mejor acción de adaptación. Asimismo, incluye preguntas guía para aquellos países que se planteen usar el proceso PNAD de esta manera, así como mensajes clave para los y las responsables de la elaboración de políticas. Cette note d’orientation repose sur une étude approfondie des liens entre PNA et CDN. La note d’orientation souligne que lier le processus PNA et les CDN peut accélérer une action renforcée d’adaptation. Elle contient par ailleurs des questions directrices à l’attention des pays qui envisagent d’utiliser le processus PNA de cette manière, ainsi que des messages clés pour les décideurs politiques. 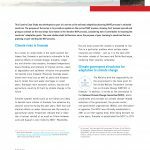 Climate Change Policy Brief: Can climate vulnerability and risk be measured through global indices? This policy brief addresses the difficulties of determining vulnerability through global indices and gives recommendations on how to use and interpret them including in the international climate policy context. The policy brief is based on a comparison of country rankings of four common vulnerability and risk indices. 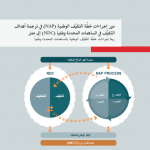 This policy brief explores benefits, opportunities and challenges of using the NAP process for the implementation of NDC adaptation goals and how the NAP process can inform future iterations. 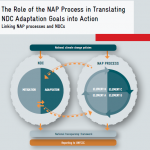 The policy brief argues that linking the NAP process and NDCs can accelerate enhanced adaptation action. It also contains guiding questions for countries considering to use the NAP process in this way, as well as key messages for policy-makers. 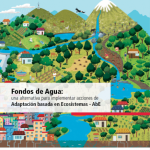 Este póster ilustra las principales características del Documento Técnico “Hacer que la Adaptación basada en Ecosistemas (AbE) sea eficaz – Un marco para definir criterios de cualificación y estándares de calidad”, el cual proporciona un marco de evaluación práctica para diseñar, implementar y monitorear las medidas EbA proponiendo un conjunto de 3 elementos, 5 criterios de calificación y 20 estándares de calidad e indicadores de ejemplo. Se propone responder a dos preguntas: 1) que cualifica como EbA? 2) cómo diseñar y aplicar las medidas de EbA de manera más efectiva? El documento fue desarrollado conjuntamente por GIZ, UICN e IIED junto con el apoyo activo de los miembros de Friends of EbA (FEBA) y la Comunidad de Práctica de EbA. The chapter outlines four key considerations for the development of an Adaptation M&E System and presents principles, frameworks and recommendations for M&E of community-based adaptation. This poster is illustrating the main features of the Technical Paper, “Making Ecosystem-based Adaptation Effective – A Framework for Defining Qualification Criteria and Quality Standards” provides a practical assessment framework for designing, implementing and monitoring EbA measures by proposing a set of 3 elements, 5 qualification criteria and 20 quality standards and example indicators. It intends to answer two questions: 1) what qualifies as EbA? 2) how to design & implement EbA measures more effectively? 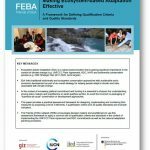 The paper was jointly developed by GIZ, IUCN and IIED together with active support from Friends of EbA (FEBA) members and the EbA Community of Practice. 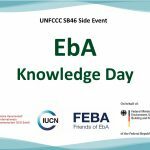 EbA Knowledge Day that was convened on 11 May 2-5 pm during UNFCCC SBSTA 46 in Bonn fostered sharing knowledge and practical experiences for strengthening EbA into policy frameworks, at national and subnational level based on practical examples. The event covered a)	Key statements of BMUB and panelists from South Africa, Swedish Biodiversity Center, Uganda, Philippines and FAO b)	Market place inputs and poster documentation, as well as c)	Final key statements from participants. Inputs during the panel discussion and market place resulted in a lively exchange among delegates and representatives from governments, international organizations, NGOs and research on knowledge and practical experiences for strengthening Ecosystem-based adaptation into policy frameworks, at national and subnational level based on practical examples.